This is a pioneering trek in a remote corner of far west Nepal, one of country's last true wildernesses. 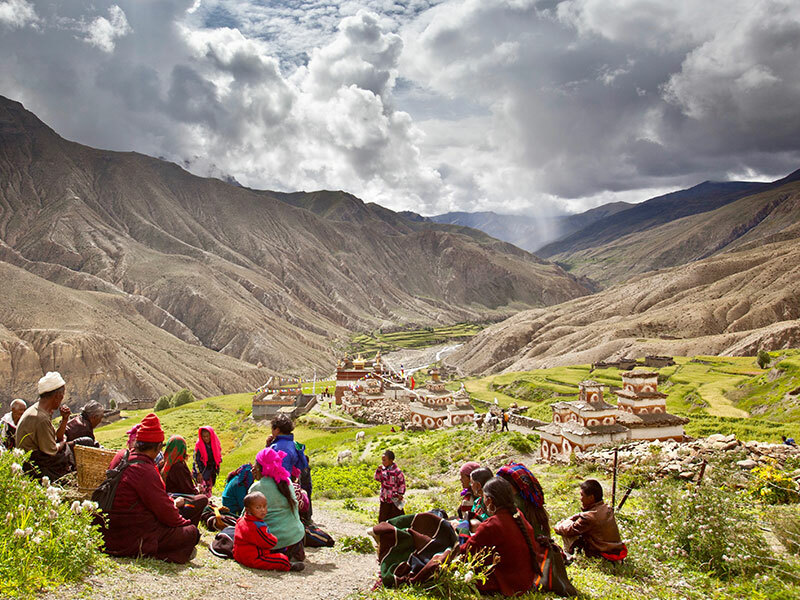 The idyllic Limi Valley is located in beautiful upper Humla which borders Tibet, and here traditional Tibetan culture has been far better preserved than across the border. You will see ancient monasteries, which are still very much in use today, and the friendly Limipas still follow an age-old way of life. Crossing two high passes the trek, graded Moderate/Vigorous, follows a circuit around Chyoro Ri and is scenically and culturally diverse. There is an abundance of wildlife in the region and you stand a good chance of seeing blue sheep, mountain eagle and if you are very lucky, possibly even the elusive snow leopard. Strict government limits on visitor numbers ensures that the few visitors who make it here are warmly welcomed, and you will have ample opportunity to meet the friendly villagers of upper Humla. The trekking starts from Simikot (2910m) following the beautiful Karnali River which flows from Tibet’s Lake Manasarovar, the most holy lake in Tibet. 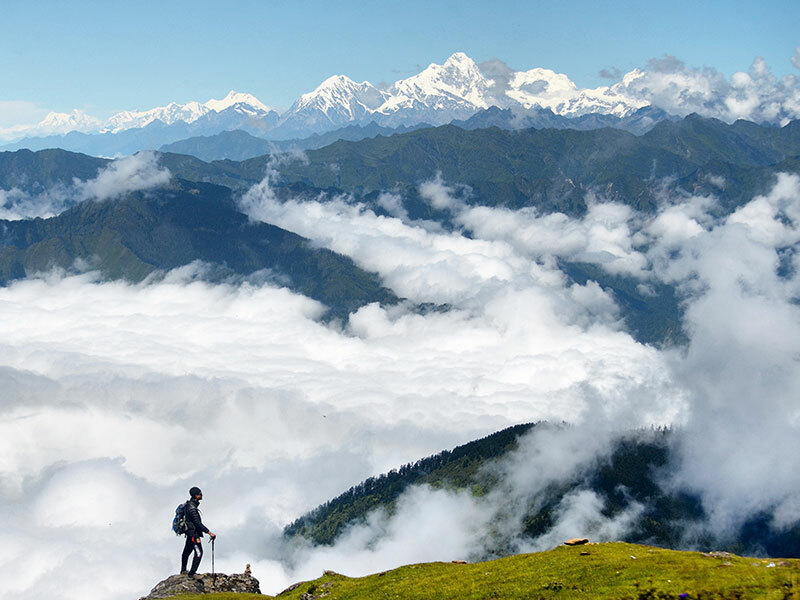 Trekking through beautiful mountain scenery towards the border town of Hilsa, you will encounter three different ethnic groups - Chetries, Thakuries and Lamas. You climb the first high pass, the Nara La (4500m) before Hilsa, and then from here head northeast to enter the Limi Valley. Once in the Limi Valley you trek through barley and buckwheat fields, passing the attractive stone villages villages of Til, Hilga and Jang. About 500 people live in the large village of Halgi whose beautiful meadows are surrounded by clear, icy rivers and set against a picture-perfect mountain backdrop. The Rizing Ling gompa (monastery) here is over 1000 years old and contains a selection of artifacts, paintings and relics from the Gergu pa sect. Leaving the Limi Valley you climb once again to the Nyalu La (4,950m). From this pass, weather permitting, there are sweeping views, which include Mount Kailas, the most holy Mountain in Tibet. Finally you descend to the lake of Selima Tso, and complete the loop back to Simikot via Kermi along the pine-forested Karnali Gorge. Depending on your arrival time, our representative will be at the airport to receive you and transfer you to your booked hotel. Kathmandu, Asia’s hippie capital, has a wonderful mixture of crowded bazaars, Hindu and Buddhist temples, shrines and stupas, colonial and ancient architecture as well as more modern buildings. In the afternoon we suggest you rent a bike or hire a rickshaw to explore the bazaars and temple complexes to best absorb the myriad impressions assailing your culture-shocked senses! Any sightseeing in and around the city can be arranged, you could hire a mountain bike or take a ride out to the fascinating city of Bhaktapur, an hour or so east of Kathmandu. There are plenty of excellent places to eat in Kathmandu, cheap, noisy and cheerful in Thamel or more luxurious in the surrounding areas of the city. Today your leader will arrange the special permit which is needed to enter the Limi Valley. We fly to Nepalgunj today and stay overnight in the hotel. Fly to Simikot (2960m) (2 hr flight). You are transferred to the domestic airport today for your flight to Simikot. This is an exciting flight with excellent views of the Himalaya. Breathtaking flight, this time with views of the pine forests and mountains of North West Nepal. Simikot is a small town with several different ethnic groups – the Chetries, Thakuries and Buddhist lamas. Depending on the flight timings there may be time to start the trek to Dharapuri (4-5 hours trekking) otherwise you will stay overnight at the guest house in Simikot and start your trek the following day. If you didn’t trek to Dharapuri yesterday your day will start by climbing a rocky trail from Simikot airstrip, past wheat and barley fields, to a large rock cairn at the top of a forested ridge overlooking the town. The trail from here makes a long, unrelenting, steep descent through deep pine forest on a rock–cluttered path with switchbacks. There are a few teashops with very limited stock but you will be able to get a local tea and soft drinks. The view from the trail down the Karnali valley is spectacular. After your steep descent the trail levels out and there is an easy traverse to the village of Tuling (a Thakuri village). Tuling is beautiful but very primitive. The campsite, in a lovely spot by the river, is about 45 minutes from the village near the Yakba Khola. After a hearty breakfast you take the trail, and climbs to a police check post where your guide will show the trek permit before you continue on to Dharapuri village. From the village it is a long traverse across a scree slope to a stream. Below the trail a bridge over the Humla Karnali leads to Khangkagaon, a Thakuri village on the opposite side of the river. This is the last Thakuri village and the upper limit of the rice cultivation in the Humla region. You will pass beautiful waterfalls as the trail climbs steeply through rock cliffs before lunch at a lonely teashop. After lunch the trail climbs up to the campsite at Dhara Kermi. The village and the hot springs are another 30 minutes from the campsite. Take time to relax in the hot springs – the main pool has been lined with stones by the local villagers. This is a fairly easy day with an easy climb and great views of the 7000m peak Mount Saipal. You continue to follow the Karnali River through pine forest before you drop from the Sali pass (3,113m/10,213ft) down to the Chumsa Khola or river where your lunch waits for you. After lunch it’s a two hour walk to the camp site near the Alban School. You could visit the Namka Khyung Zong gompa, which is about 50 years old. There are 70 monks of the Red hat sect and they also have a Rinpoche. There are great views from the campsite of the surrounding mountains of the upper Humla area. After breakfast you slowly ascend the scree slopes and start descending down towards the river – take care on the loose rocks. The trail wends its way precariously close to the river on a track built up with rocks and wooden props on a few stretches where the path was blasted out of the cliff. 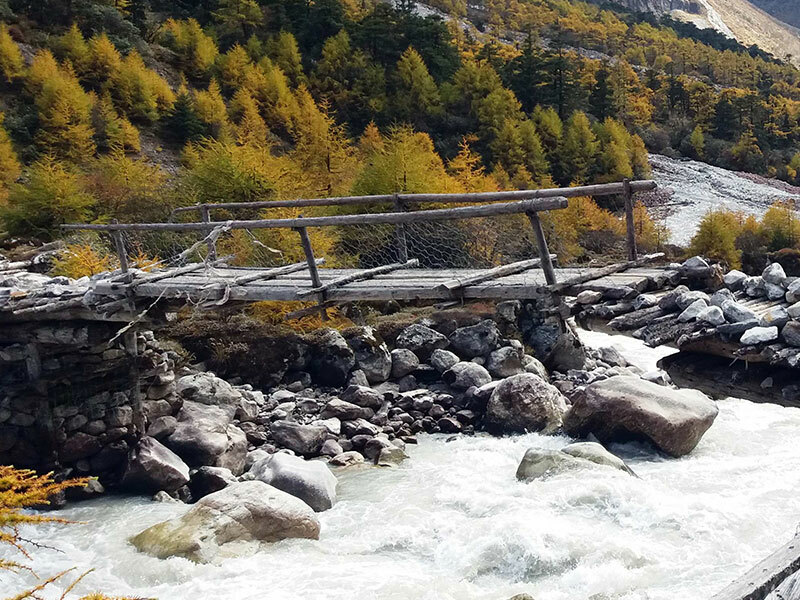 After more than a few hours of ups and downs you will reach the suspension bridge (2,500m/8,202ft). Here you cross to the south bank of the Karnali river and climb up to the village of Much. You pass the village and the police check post and in the distance you can see the Sakya Monastery and the village of Tomkot on the top of the hill. The campsite is just below the monastery at Tumkot. This is a long but absolutely beautiful day. You leave the Karnali River to your right and start ascending to a small pass, La Nangla (3,310m/10,860ft). About an hour after the pass the trail levels out and you can see the man made road to the border with Tibet. Lunch will be waiting for you in Palbang. After lunch the trail climbs gradually up to the spread out village of Yari. To the west of the village a trail leads to the Sarpa La, a less used route to Tibet. This is the trail the Khampa leader Wagdi took in 1975 in an attempt to escape into India after the USA removed its support for the Tibetan resistance. He crossed into Tibet at an unmanned and isolated corner and re-crossed into Nepal via Tinkar Pass south of Taklakot, where the waiting Nepal army ambushed him. From the Yari village the campsite it is about another hour to Tharo Dhunga (4,000m/13,124ft) where you camp beside a large rock. You could get snow on the pass so make sure you dress warmly today as it can get very cold. You start climbing up from the camp site to a meadow and stream at 4,160m/13,648ft and another meadow, Sipsip, near the foot of the pass. Despite the remoteness of the location, there is a considerable amount of traffic by the traders who are trading from the China border and who bring all sorts of goods to sell down in the Humla region. You will see lots of yaks, goats and horses carrying Chinese goods. Finally you come to the top of the Nara Langna pass (4,580m/15,026ft). If it is a clear day the views are stunning as you look down to the western Humla Mountain ranges. Take care again on your descent as there could be snow. A short distance below the pass you will get a panoramic view of the Tibetan plateau, the Humla Karnali river and the green fields of Sher far below. You also can see the trail across the valley towards the northeast on the way to Limi Valley. You take the road which contours around the mountains and finally heads down to the Hilsa Village. It’s the last frontier of the Nepal border. There are a few stone houses in the village and you will camp in the back yard of a guesthouse. You cross the bridge and it is 150m to a Sher village and the Chinese immigration check post. After the police check post at Hilsa you cross the bridge and immediately start a steep ascent up the barren slope for an hour where you will meet the main trail which comes from Sher to the Limi valley. The undulating trail from here heads north east, looking down onto the Humla Karnali river, to a stone chorten (4,110m/13,484ft). The views are stunning, and you may see lamagier mountain eagles, blue sheep and keep a look out for snow leopards. The trail from here is well-maintained it crosses a rock slide and then climbs above a recent landslide. You take the upper new trail over the top of the landslide and drop down to meet the original trail on the opposite side. Lunch at Manepeme (4,014m/13,169ft) is behind a ridge in a large side canyon near a stream. Manepeme is named for a huge stone that is carved with a mantra “Om Mane Padme Om”. After lunch the trail weaves in and out of ravines on the side of the valley, climbing gradually towards the foot of the rock face. You ascend to the foot of the cliff climbing to a ridge at 4,164m/13,662ft where you will camp. From this camp site there is a great view east looking towards the Limi valley and to the south where the Humla Karnali river turns and flows thought a steep gorge. This is an exciting day as you will see the first village in the Limi valley. You climb steeply again from the camp site to the Lagna pass (4,300m/14,108ft) from where you get your first view of the Limi valley and the green fields of Halji in the distance. The trail descends to a tiny stream then continues down and crosses a slope. You climb over two rocky ridges and make a short descent to two chortens that mark the end of the ridge above Til Chu. Here you get your first glimpse of Til Gompa across the valley and the barley fields of Til village, and then descend to a fantastic campsite at the confluence of Takchi Chu and Til Chu. Near the camp site there is a snow leopard trap - there is one near each village in Limi valley due to snow leopards killing the villagers’ livestock. This morning you follow the Takchi Chu River, crossing it on a wooden bridge, and pass a barley field before arriving at Halji (3,670m/12,041ft). We would recommend a visit to the Rijziling gompa, in the heart of Halji village. The Gompa is over 1,000 years old and about 30 monks live there. The total population of Halji village is around 500. The people of Halji grow barley once a year and they also trade with China - this village, surrounded by willow trees and great mountain ranges to the north, is probably one of the most beautiful villages in the area. After lunch you continue to follow the river and then climb steeply to the ridge at 3,850m/12,631ft from where you descend to the deserted police check post at Sunkhani. The trail starts to undulate and becomes rockier. A series of irrigated barley fields mark the beginning of Jang village (3,930m/12,894ft) (also called Jyanga), an impressive stone village with a white gompa. The people of Limi make wonderful, well-finished wooded bowls from pine, birch and maple trees that grow on the south side of the river and should you wish you can buy them from the local people. The demand for the bowls and the scarcity of the maple trees mean that the Limi people have had to source an alternative supply of wood from Kumaon in the Northern India. The bowls, however, are still made in the Limi valley. You pass the village and after about a 45 minute walk up the hill you come to a fantastic camp site with hot springs, the perfect temperature for you to enjoy! This is a lovely place to have a rest day and explore as much as you can of the Limi valley. A day to explore the valley, catch up on some washing or just relax in the hot springs. After a good rest you now continue across the meadows, jumping across a few small streams, and then climbing over a rocky ridge. The trail however is mostly level and makes for very pleasant walking. Crossing a bridge you head south to Talung, passing the sand dunes that form the lake of Tshom Tso. Below this plateau is Gumma Yok (4,170m/13,681ft) which was once the most important village in Limi. The village was abandoned many years ago but you can still see the remnants of a few buildings. You can either cross the river by foot or, if you don’t want to get wet, take the alternative route, which takes about an extra half an hour and passes a little hot spring en route. Once across the river it is about an hour of ascent to the camp site at Talung. This area is also used for grazing yaks and cattle in the summer time (June to August) by villagers in the Limi valley. This morning you climb to the next valley and cross the meadows to the foot of the pass, and the last of the shepherds’ huts at the foot of the Dimochu, the huge glaciated peak dominating the head of the valley. Now the hard work begins as you head east into a rocky valley at the foot of the climb to the pass. After about two hours you come to some rock cairns and finally the pass. On a clear day you can see Mt Kailash (the holiest Mountain in Tibet). From here you will get spectacular views of the northern Himalaya. Below the pass the trail makes a U–turn and heads south. Descending along the moraine you pass a small lake and then follow the Salie River all the way down to the campsite at Chungsa or Shinjugma. We leave the campsite with the open valley, walking through Birch & pine forest and along the river. After lunch we ascent through the forest and come to the alpine arear with great views of the mountains and the pass. We camp near the Salie river. Its an early start up toward the pass – The path is quite straight forward and ascent gradually zigzag towards the pass. It takes about an hour to reach the pass . When you get to the pass the views are stunning. Looking down to the south is the Simikot ridge and looking toward the North West are local mountains. After the pass its all the way down passing the local Yak grazing stone huts to the river where you have your lunch in the forest. After lunch the path zig zags up through some beautiful pine forest before descending to the camp site near the lake Dinga. This is a beautiful walk with great views of the local Humla Mountains and forest. This is your last day of your walk – so please tie your boot lases tight as you have a long descent of 850m down through spectacular views of the rocky mountain and the forest of walnut trees on the other side of the Yakpa village. Once you reach the village you have to cross the Yakpa River and then ascent through the pine forest for 500m up to the ridge where you traverse for an hour before descending down to Simikot village and complete the whole circuit of the Limi Valley trek. Fly to Nepalganj and on to Kathmandu. We will take the earliest flight from Nepalgunj to Kathmandu depending on the availability of flight seats. Upon your arrival in Kathmandu, our representative will be there at the domestic airport to receive you and transfer you to our hotel. Rest of the day will be a free day to relax after the long trekking days. We deserve a free day where we can relax in our hotel garden with some chilled beers or go for a full day sightseeing that can be arranged upon request. Depending on your flight time, our airport check in is 3 hours prior to the departure time and the hotel checkout time is 12 PM. In case our flight is late evening please let us know if you require half day use of the hotel. Washing soap, towel, tooth pest, tooth brush etc. This tour spends four nights in a hotel in Kathmandu and eighteen nights on the trek in tents on sharing basis. In Kathmandu we normally use a 3-star hotel, located within walking distance of the Thamel. On the trek, we will stay in two men tents with our kitchen staff preparing the meals including breakfast, lunch and dinner. During long day walks, we might have to prepare packed lunch in the morning and carry with us. Day 2 : At leisure in Kathmandu. Day 4 : Fly to Simikot (2960m) (2 hr flight). Day 20 : Fly to Nepalganj and on to Kathmandu.